I received 5 of the 11 Father’s Day products, which includes two new knot wraps! Almost every product in the range has a strong sandalwood scent, which is definitely on the more masculine end of fragrances available in LUSH products! Sandalwood isn’t my prefered fragrance but I think it really does suit a Father’s Day range. I do think that someone who is partial to this scent will really enjoy this range because the products are all fantastic! This Dirty Gorilla Perfume scented styling cream gives the hair a medium hold with a matte finish, ideal for keeping your hair in place without it looking stiff. With the signature Dirty scent, you can really be head to toe in products with this sandalwood, pine and salty scent! The hold itself comes from Japan wax, cocoa butter, illipe butter and coconut oil! It is perfect for sensitive scalps with a blend of linseed mucilage and balm! It retails for $19.95 for a 100g pot! Another Gorilla Perfume based product, featuring smokey sandalwood, again. This scrub uses bamboo stem to exfoliate the skin, papaya juice to brighten and refresh the complexion, and finally, rosehip and moroccan argan oil to hydrate the skin! This product definitely has the most subtle Sandalwood scent and I really enjoy it. Just like the facial scrub, this multi purpose cream shares the Smuggler’s Soul sandalwood heavy fragrance! 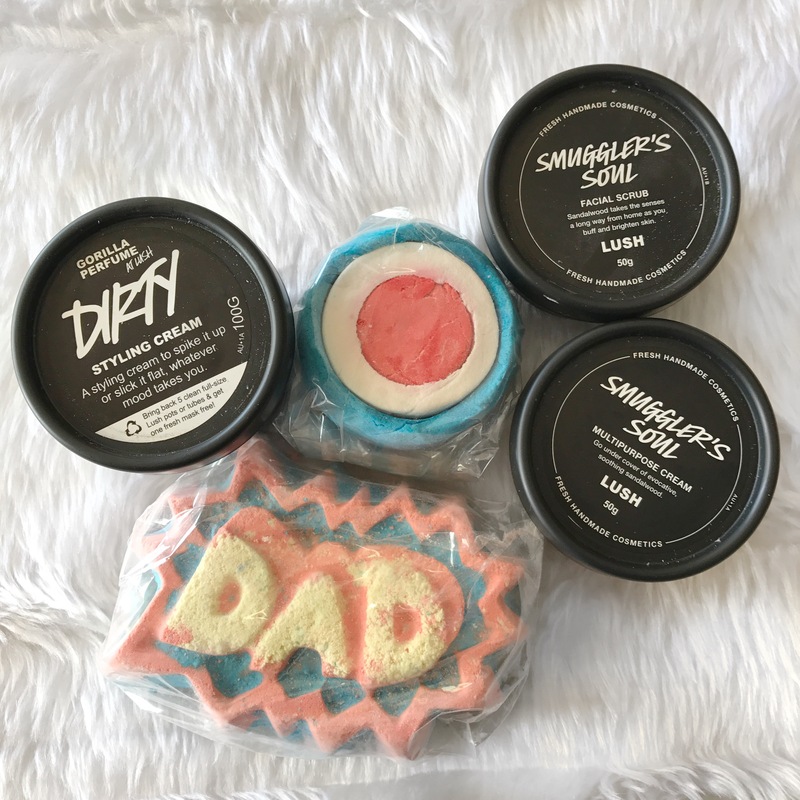 This one definitely has the strongest sandalwood scent so if you’re unsure whether your dad likes the scent, this product might be a risky buy but this product is filled with gorgeous products to calm and moisturise the skin! Cucumber is used to cool the body and argan oil moisturises. This gorgeous and bright bubble bar is filled with Brazilian orange oil and is definitely a fragrance that I am drawn to! As is the case with most LUSH Bubble Bars, this product is just a whole lot of fun. Every dad deserves a break and a bit of fun, this product is for every dad that’s just a big kid in an adult body. It would make a great addition to any presents you’re already planning for your dad! Bath bombs are great ways to relax those sore muscles! With guaiac wood, sandal wood, and olibanum oil, your dad will be set for a bath worthy of a man of steel! You should definitely check out some videos of this bath bomb in action, it looks incredible! Other products that I would definitely recommend checking out are the Stairway to Heaven soap and the Dirty Shower Gel! I might have to give those face scrubs a shot! Do they seem harsh? It seems really lovely because the scrubby bits are suspended in a creamy mixture. It’s less harsh than something like Angels on Bare Skin, in my opinion!